This post is sponsored by Benbella books. All opinions are my own. When I was in London for my mother's 80th birthday a few years ago we where being held hostage by a very pedantic tour guide at the British Museum. He was going on and on about the importance of the Rosetta Stone... which really is quite a site to see. Because it was written in both ancient Greek and Egyptian it was the key to translating Egyptian hieroglyphs. Well, my mother was just not impressed, and she had it with the tour guide droning on and on. So in the middle of his lecture on the Rosetta Stone, she announced: "It's all Greek to Me." "I'm going to the Starbucks across the street.. anyone else want to join me?" 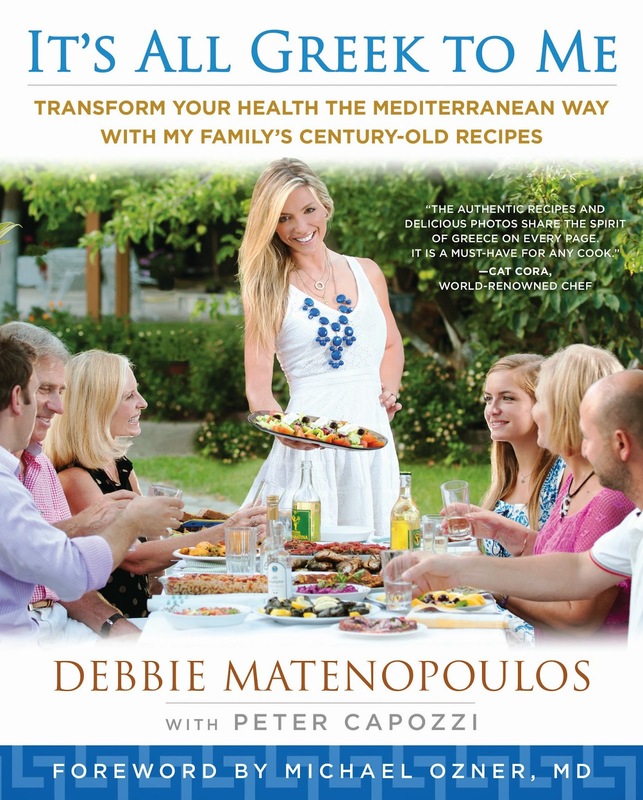 Now, Debbie Matenopoulos's cookbook, "It's All Greek to Me." unlocks the secrets to Greek cooking while entertaining you, not boring you, with stories and pictures of her and her family in Greece. Debbie Matenopoulos, you might know her from "The View" and "Entertainment Tonight." along with many other shows she has hosted or has been a reporter on... the girl's got talent and a real sense of food and family. I was so touched by the stories of the people who worked with her on this cookbook and got to know the importance of food to her family and in the Greek culture in general. What makes the Mediterranean diet so healthy is not just the food... which is incredibly good for you, but the lifestyle that goes along with it. Debbie really shares in this collection of recipes from her mom and other friends and family the importance of slowing down and eating and enjoying time with the people you love. 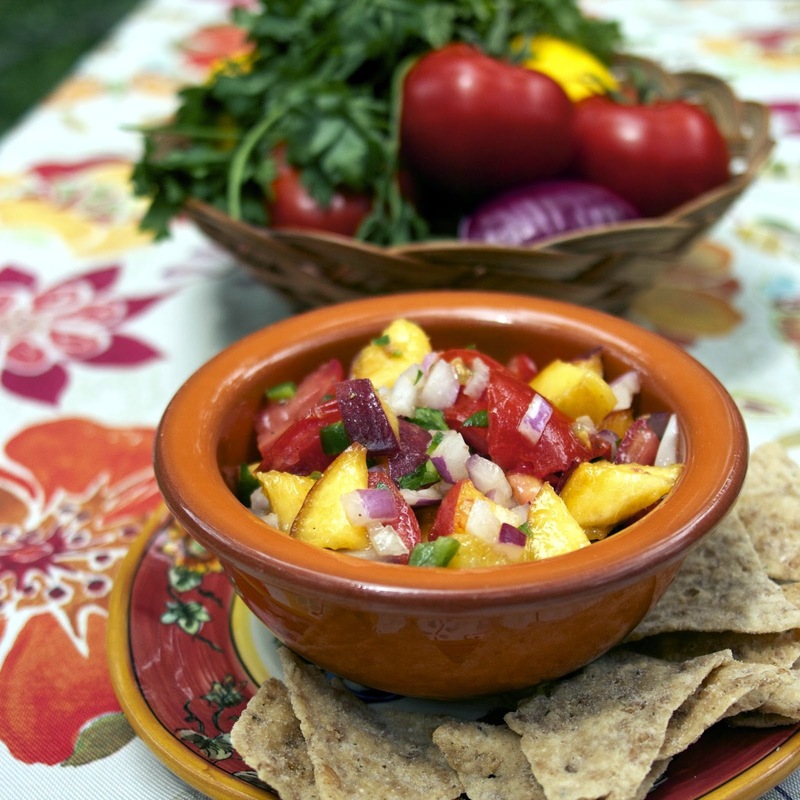 This peach salsa is perfect for this time of year and it combines so many fresh seasonal flavors together. My family and I sat around devouring this dip and enjoying a beautiful summer day. I recommend you get a copy of "It's All Greek to Me." and do the same. by Debbie Matenopoulos from, "It's All Greek to Me." When peaches are in season, I eat them nearly every day. 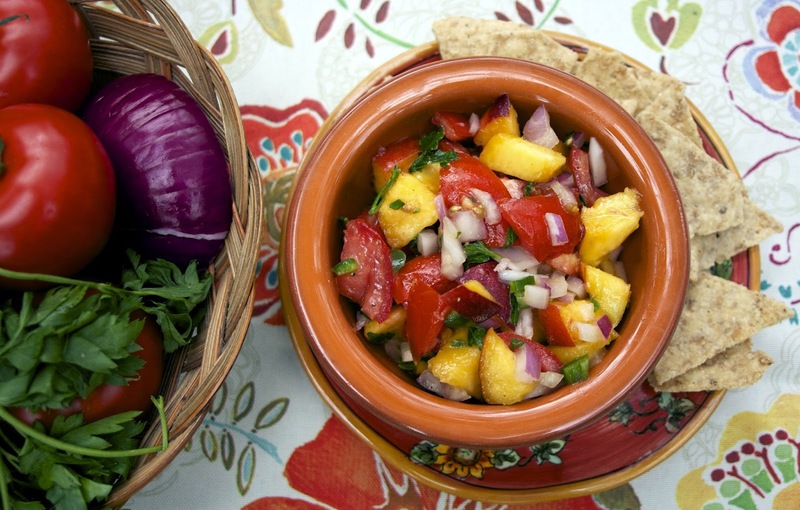 Summer peaches in Greece are huge and incredibly fragrant, so I created this salsa in their honor. It pairs well with simply grilled fish and chicken. Although it’s not traditionally Greek, I make this salsa often because we have an abundance of fresh peaches from the peach trees in our yard. In a medium mixing bowl, gently stir together all the ingredients. Taste and adjust seasonings, if necessary. You can make this salsa a few hours ahead, cover, and refrigerate to allow all the flavors to come together. VARIATION: For an interesting flavor and a little more crunch, use 1 cup peeled, diced cucumber in place of the tomatoes. Debbie’s Tip: Like your salsa spicier? Don’t remove the seeds and white pith of the jalapeno pepper. That will add some more heat. Saturday: Quiche made with leftover cheese and vegetables from the week. This sounds wonderful to me and so fresh. Peaches & tomatoes are fabulous together. I love the story behind how recipes are discovered. Your mom sounds lovely! I admire her bold honesty. This peach is a must-try for us. And you're so right about Mediterranean people. That laid-back lifestyle is the key. We rush too much around here. Oh I so agree... I need to slow down myself. My mom is getting bolder and bloder as she gets older. I hope I'm the same way. Thanks for visiting Coco. Pinning this to my 10 ingredients or less board. Looks great. And next week I am going peach picking so I will need recipes! Thanks for the pin Suzy. 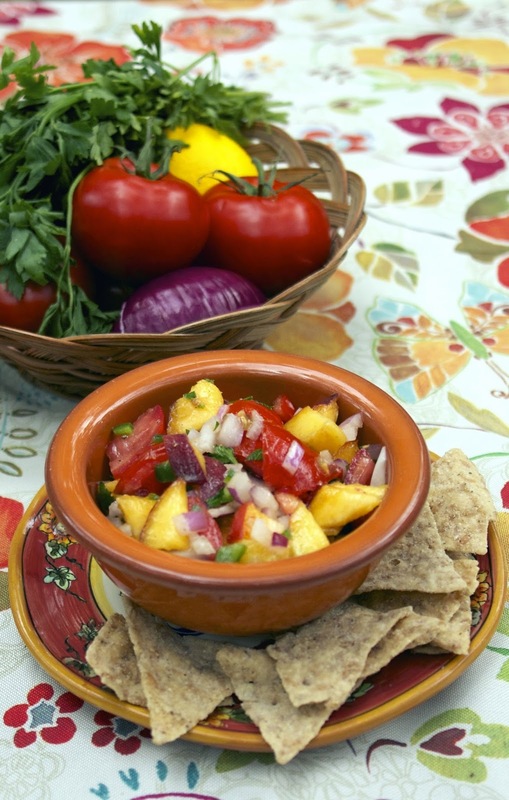 I have some peaches ripening that I plan on making this salsa with on Friday. This looks so delicious! And I love the commentary about slowing down and really using food as a way to connect with family. Thank you for linking at the In and Out of the Kitchen Link Party. Hope to see you again next week. This sounds so fresh and tasty! 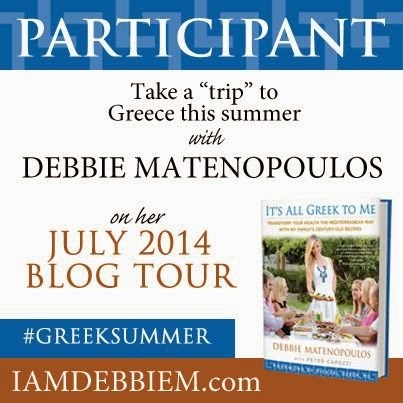 I participated in the blog hop for It's All Greek to Me, also...great cookbook and fun to read! Yes, I agree great read and great recipes.